How Boris Epshteyn and Sinclair bring Trump propaganda to local news. 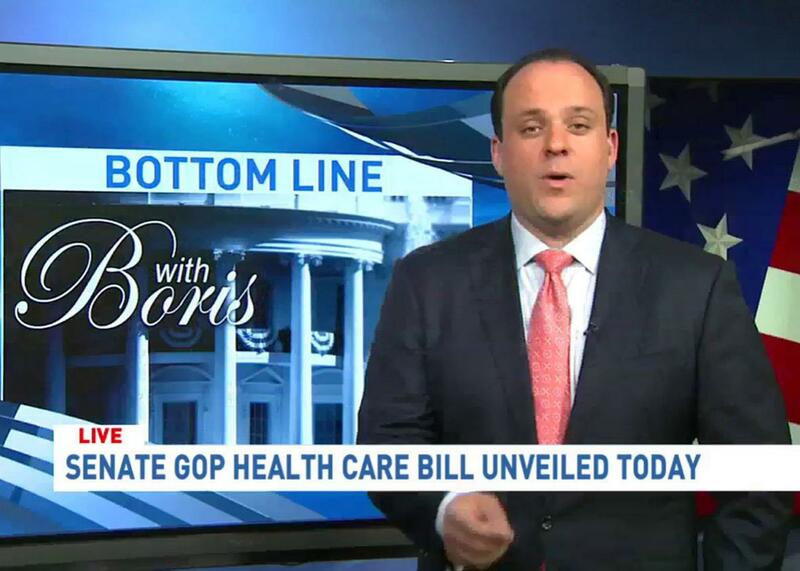 How Sinclair Broadcast Group and Boris Epshteyn took administration propaganda from the Oval Office to the local news. Nowhere in the segment does Epshteyn explain how canceling on-camera press conferences will improve the flow of facts from the Oval Office to the populace. In the meantime, spouting off on TV seems to suit Epshteyn just fine. The former special assistant to President Trump hosts the 90-to-120-second program “Bottom Line With Boris,” which as of last week has been scheduled to run eight or nine times a week on Sinclair’s 173 local TV stations in 81 markets. As the Baltimore Sun points out, Epshteyn will dispense cheerful propaganda on the local news for roughly 13½ minutes each day—nearly a quarter-hour of Trump-friendly agitprop, disseminated to more than 2.2 million U.S. households by a right-leaning company worth close to $40 billion. Until a few months ago, Epshteyn was on the White House payroll. In addition to his special assistant position—which, per Politico, entailed “oversee[ing] White House officials who appear on television to speak on behalf of the administration”—he also served as communications director for the Trump inaugural committee and senior adviser to the campaign. There, the surrogate for America’s bully-in-chief developed a reputation for bellicosity. As the Daily Beast recounted, he’d pleaded guilty to assault in 2014. The House Intelligence Committee also wants to question Epshteyn, who was born in the then–Soviet Union in 1982, about his ties to the Kremlin. In March, not long after the Jewish staffer had crafted the notorious Holocaust Remembrance Day statement that omitted any mention of Judaism, he left the Trump administration amid reports that everyone at every cable news network hated him. A month later, Sinclair scooped him up as a pundit. Now he’s Trumpism’s chummiest salesperson, an everyman touting a #MAGA fantasy. Highlights of Epshtyen’s “Bottom Line” include a lecture on the brilliance of America First trade policies and a paean to how much safer we all feel now that soft-on-terror Barack Obama is out of our lives. The former investment banker has also steered viewers’ attention toward 2017’s roaring economy, the perils of voter fraud (which he implies cost the president a popular vote victory), and the woeful irresolve of GOP senators to pass their new health care bill. Epshteyn frequently sprinkles in “reports” of dubious provenance and alludes to unnamed “critics” and “opponents” who espouse conveniently self-defeating arguments. “And that’s the bottom line,” he declares with a smirk at the end of many of these bits, having solved another of our nation’s problems in two minutes or less. That refrain, a Pavlovian chime, announces Epshteyn’s honesty. It tries to tame the exhausting and depressing political surround, a hubbub of collusion and interference and corruption. When James Comey testified in June, the eponymous “bottom line” was that the former FBI director had discredited the mainstream media’s inaccurate reporting and defended the president’s honor. On July 4 it was that, despite their divisions, Americans are bound together by the crusade for freedom. Perhaps TV audiences crave a simple, positive, irrefutable message about where their country is headed. Epshteyn serves up this wish as naked assertion, in attractive lighting, on a platter painted red, white, and blue. In a riff on Last Week Tonight, John Oliver compared the “Bottom Line” host with another Sinclair talking head, conservative blowhard Mark Hyman. (Oliver also memorably described Epshteyn as “a rejected extra from the Sopranos in a JCPenney’s tie whose voice sounds like Sylvester Stallone with a mouthful of bees.”) But Hyman—known for flaying millennial “snowflakes” for caring about racism—is abrasive and adversarial. Despite his truculent past, Epshteyn affects a reasonable tone. “Bottom Line With Boris” is a news nugget designed to fit in amiably alongside the local traffic and weather. Its host—once the jerk who dismissed Khizr Khan as a Democratic Party prop—now scans as artless, a little oafish, congenitally straight-shooting, inherently trustworthy. He has neither Anderson Cooper’s supple erudition nor Rachel Maddow’s wit and verve nor Sean Hannity’s magnetic rage. He’s a regular guy telling regular stories about how Trump is great and the rest of the media—present company excepted—can’t handle the truth. Several websites of Sinclair-affiliated TV stations soon published the segment’s transcript, under the somewhat ironic title: “Opinion: CNN Struggles With Impartiality.” The problem here isn’t that Epshteyn is expressing his right-wing views. (Or it isn’t merely that, though the particular set of “facts” he presented about CNN were cherry-picked to support a predetermined thesis.) The issue is that Epshteyn’s commentaries—amplified by a rich and sprawling pro-Trump enterprise—are colonizing even the virgin corners of the local news landscape. Sinclair has the power to saturate the country in POTUS-friendly voices and opinions. That’s the kind of move that, it stands to reason, might help a media conglomerate that’s awaiting an important ruling from Trump’s FCC. Hark! Another bottom line.